Irish garden flag features shamrocks and Luck 'o the Irish. 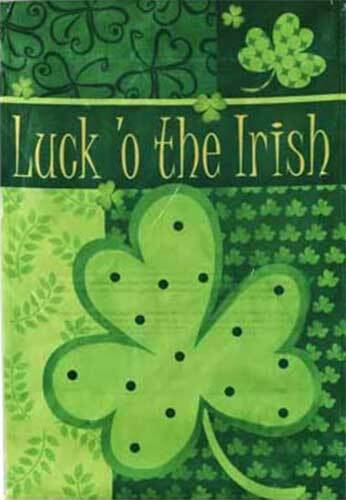 Use the flag to decorate at St. Patrick's Day or to celebrate being Irish at anytime of the year. This lightweight banner style Irish flag does not include a pole, but it does include our shamrock history card. This Irish garden flag from The Irish Gift House is a green on green design with shamrocks and Luck 'o the Irish. The shamrock flag is weather proof and UV treated and measures 12" wide x 18" tall. Plush Irish Teddy bear features a colorful tricolor design and has the Irish flag on his tummy along with on his back. Irish flag features your Irish coat of arms in the center of the large tricolor design. Irish decal features the green, white and orange tricolor flag.